Beauty Costs > How Much Does Resoling Shoes Cost? How Much Does Resoling Shoes Cost? Resoling shoes is a type of repair procedure performed to restore the soles of a shoe, the part of the shoe that makes contact with the ground. 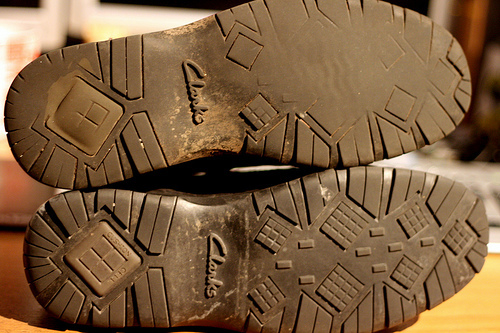 For this reason, soles can be damaged or become thin over time, and when this happens, the shoe can be unusable. The price of resoling your shoes depends on the amount of damage the shoe has and the company performing the repair. On average, a simple resoling job can cost anywhere from $45 to as much as $100 for just the resole, but some professionals, often referred to as a cobbler, may have packages that include a resole, along with other jobs such as replacing the footbeds, heel bases, welts and repairing any loose stitching. According to forum members on askandyaboutclothes.com, they said it could cost about $40 to $50 for a leather pair of shoes. Red Wing Shoes, for example, can resole shoes from its brand only, including new heels, for about $100. They also have a premium repair package, which includes a resole, repairs and a reconditioning for $125. Tulsa Shoe Rebuilders, located in Tulsa, Oklahoma, lists its prices online, with a full leather sole costing $95 and a half leather sole $75. Dr. Martens, a popular boot, offers resoling options on its official website for $75 to $95, with a turnaround time of up to four weeks. If you were to do it yourself, a DIY kit could cost $10 to $25. Some professionals, as stated above, may include more than a resoling if you were to choose their customized packages. These packages could often include a new footbed, new leather stitching, a waterproof reconditioner and a newer heel base. As long as the shoe is in good condition, it should only take two to three days to have your shoe resoled, but if you were to have it mailed to a company, it could take up to six weeks. Reputable professionals should guarantee their work for anywhere from six months to two years. If any of the repair work were to be faulty, then they should fix it for no charge. A sole can be damaged in various ways, but there can be damage to other parts of shoe besides the sole. For example, if the heel were to be damaged, this would have to be replaced and could be an additional charge, usually $20 to $45 extra. Other common repairs include replacing the heel pad, the heal backing, sock liner, shank spring, heel base and/or replacing a zipper. Some of the price quotes mentioned above may only include average sizes. If your boots or shoes were to a larger than average size, then an additional $20 to $40 may be applied to the price. If you were to choose a shoe repair service online, additional shipping fees may apply. Sole guards, adding a heel guard and refinishing the upper part of the shoe is often a premium add-on offered during the repair, usually costing about $40 to $60 each. To know if your sole needs to be replaced, simply press your thumb in the center of the sole to see if it feels weak. Secondly, look at the bottom of the shoe to see if it has developed any sort of wearing pattern. Lastly, look at the edges of the shoe to see if the part where the sole meets looks uneven. Avoid keeping your shoes out in the heat as this will help the sole last longer. Always try to keep your shoes clean since dirt can wear away the sole. Try to store your shoes in a dry place with a moderate temperature rather than outside. Consider doing the job yourself. If you have the adequate tools, the job may not be as hard as you think. Consider checking various resources online to see how the job can be done properly. Compare prices and make sure that the resoling process will be worth it. If you paid more than $200 for the shoes or boots, it may be ideal to get a professional resoling job done. However, if the shoes were less than $50, it may be better to purchase a set of brand new shoes unless you have some sort of sentimental attachment to the pair.